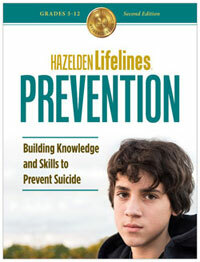 Lifelines: A Comprehensive Suicide Awareness and Responsiveness Program for Teens is Hazelden's evidence-based program for addressing suicide among young people. Lifelines is a whole-school program that educates administrators, faculty and staff, parents, and students on the facts about suicide and their roles in suicide prevention, intervention, and postvention. Lifelines was the subject of extensive research during 2005 in twelve public schools in Maine. This outcome evaluation demonstrates that the curriculum promotes increases in students' knowledge about suicide and resources, as well as expressed intent to intervene on behalf of at-risk peers. Findings also support teacher acceptance of the program and increased student confidence in the school's ability to respond to at-risk youth. Lifelines has been identified as a promising program by the Suicide Prevention Resource Center (SPRC) and is included in the Substance Abuse and Mental Health Services Administration's (SAMHSA) National Registry of Evidence-based Programs and Practices (NREPP). For more information, download the Lifelines Scope and Sequence document (PDF). 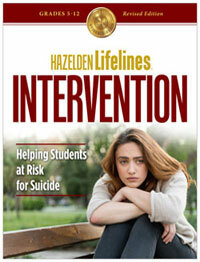 This first part of the Lifelines Trilogy educates students on the facts about suicide and students' role in suicide prevention. It provides information on where to find suicide prevention resources in the school and community. Training materials are included for faculty and staff that provide accurate and practical information on identifying and referring students who might be at risk for suicide. Lifelines: A Suicide Prevention Program also includes a presentation for parents that answers questions about youth suicide and prevention, and it involves them in the school's suicide prevention activities. This installment builds on the foundation of the "competent and compassionate school community." This program introduces the "Tell Me More" format of intervening on a student at risk for suicide, and provides information on how to prepare to interview an at-risk student, gather collateral information about the student's risk for suicide, and address specific topics. Lifelines Intervention also provides clear guidance on how best to involve parents and guardians as partners. Other topics addressed include the challenges presented by bullied students, members of sexual minorities, and students in gifted special education classes. The program includes a manual, video, and CD-ROM of reproducible material. This comprehensive, whole-school best-practice manual is specifically designed for middle and high school communities. This unique program educates everyone in the school community on how to successfully address and respond to not only suicide, but any type of traumatic death that profoundly affects the school population. 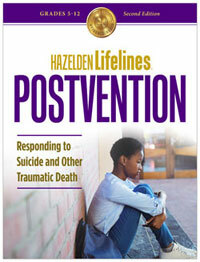 Now, organizations including school districts, mental health providers, and area education centers, can offer Hazelden’s complete Lifelines Trilogy for suicide awareness and responsiveness. For $350 per building 3 year subscription, you have the ability to print all Lifelines Trilogy materials and stream videos via Hazelden OnDemand. To learn more about this option, contact your dedicated sales manager at (800) 328-9000.